One of the questions most frequently asked of me since the release of Buckley’s Story has been why Buckley? What was so special about this particular cat, rather than any of the other cats who have been part of my life, that inspired me to write a book about her? You’ll have to read the book to find out how she changed my life in ways I never could have imagined by teaching me universal lessons about opening my heart and living a joyful life. As the old saying goes, when the student is ready, the teacher appears. In my case, the teacher came in a seven pound feline body. Amber and her five kittens were brought to the Middleburg Animal Hospital in the spring of 2000 by a client who had found the little family in her barn. Despite being emaciated and scrawny-looking, Amber’s eventual beauty was evident even then. 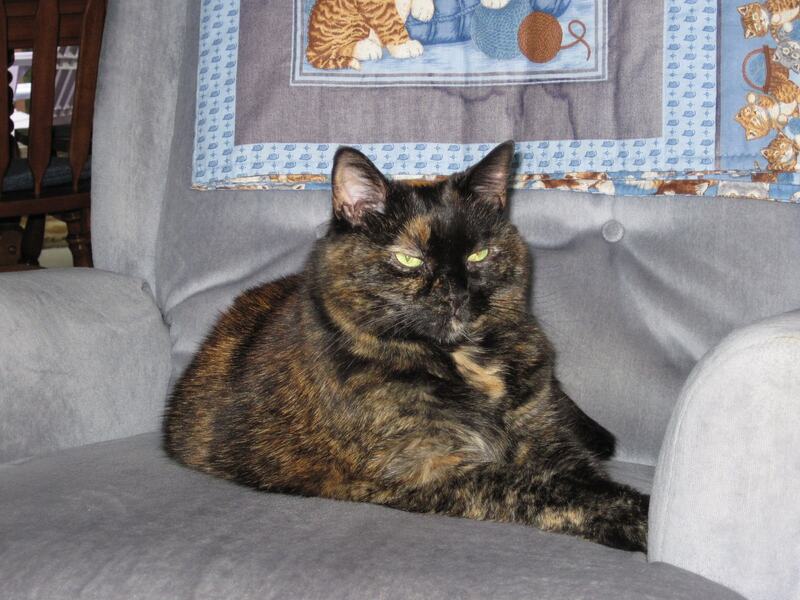 She is a dark Tortoiseshell color, with an amber-colored heart-shaped spot on top of her head, which became the reason for her name. Her kittens found new homes in fairly rapid succession. However, nobody was interested in the beautiful mommy cat. She spent her days in the big adoption cage in the hospital’s waiting area, but with the constant inflow of homeless kittens that is typical for spring and summer, nobody wanted to adopt an adult cat. I had recently lost my almost sixteen-year-old soul mate cat Feebee, and the grief over his loss was still very fresh. I did not think I was ready for another cat, but coming home to an empty house was becoming increasingly difficult. One weekend in July, I decided to take Amber home, “just for the weekend”. I wanted to give her a break from the abandoned feral kitten we had placed with her after her own kittens had all found homes. The kitten was a rambunctious six-week old grey tabby, and Amber was becoming increasingly exasperated with his constant need for attention. As far as she was concerned, she had done her mommy duty with her own kittens. After living in a cage for all these months, Amber was initially a little overwhelmed by having access to an entire house, and she spent most of that first weekend near or under my bed. By Sunday evening, she had relaxed a little and started exploring her new environment. I liked having her gentle and peaceful energy around the house, and I decided that she could stay a little longer. Not quite ready to acknowledge that she was home with me to stay, I told everyone that I was “just fostering her”. Somehow, the flyers advertising that she was available for adoption never got distributed, and she only returned to the animal hospital for regular check ups. Amber is a gentle, loving cat with a wise old soul. For the past nine years, her peaceful and solid presence, not to mention her almost constant purr, have been bringing love and affection into my life every day. She enjoys sleeping in our sunny living room, curling up with me when I sit down to read or to watch television, and watching the birds at the feeder on our deck. She is a teacher to the core of her being, and she is my writing muse. There are days when I sit down in front of the computer and stare at the blank screen with no idea of what I’m going to be writing about, but as soon as she comes into the room and curls up on the window perch next to my desk for a long nap, I feel inspired, and the words start flowing. Animals come into our lives for many reasons. Some very special animals touch our souls and change us forever. Amber is one of these special animals. Sadly, Amber passed away on May 13, 2010, after a sudden, brief illness. I will always miss her. I’ve always said that we don’t rescue animals, they rescue us. As I turn to look at Pipers soaking in the heat at the top of her kitty condo (a little chilly here this morning, so I turned on the heat) and gazing out at the birds and read Amber’s story I am reminded how lucky we are to have such wonderful animals in our lives. I can’t imagine my life without them. Thank you for doing what you do. Love your blogs. Kiss those sweet kitties. Thank you for your kind words, Cindy and Pipers. What a beautiful story. I’m happy i had the opportunity to read about her. She will be sadly missed. i think I do see a book on the horizon. What a lovely way of putting it, Bernadette. Each being provides us with a different inspiration. Amber is one of the doors to your soul. She sure was, Layla. And she had the patience to wait out my silly idea of her being just a foster kitty! Ah, the dangerous pleasures of fostering. Amber was in the right place at the right time. Best guess for Amber is that she is eleven or twelve years old, Laura. We think she was about two when she was brought into the animal hospital with her kittens. I’ve made July 29 her “birthday,” since that’s the day she came home with me, so this year, we’ll be celebrating her 12th birthday. Amber sounds like such a gentle love! How old is she? (Although I realize it is probably somewhat of a guess.) Thank you for sharing her story with us. Debbi, it’s wonderful how these “foster” kitties make their way into our hearts, isn’t it? Abbey started out being a foster also. She was so timid and frightened at that time, I didn’t have the heart to ask her to go somewhere else. Next month, I will have had her 3 years. I made the right decision. She’s a sweet kitty now. Amber definitely agrees that she should have her own book, Mason. I love Amber’s story and you should consider doing a book about her. Animals do have a way of coming to us when we need them the most, even if we don’t want to acknowledge it right then.